My Husband once was invited to attend a seminar given by one of those motivational speakers; I think it was back in the early nineties, the corporate world all of a sudden turned from strictly business to personal coaching. Maybe they still do or return to it; wouldn't surprise me with the crises we're heading towards. The seminar was all about changes, improving yourself, break throughs and taking matters in your own hand. Gosh now I think of it I might need some of that myself right now! Anyway he came home with his mind full of what he learned that day, a signed copy of the book and some stickers. Stickers to put up on the mirror in the bathroom. To be looked at first thing in the morning and make yourself ready for the day ahead. Which you had to repeat out loud with a positive mind and convincing voice. Three times. Every morning. To the mirror. I bake bread instead. 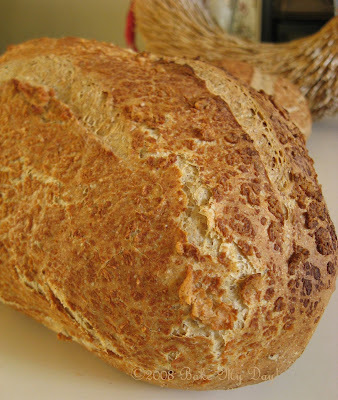 Tiger bread** maybe you recognize it as Dutch crunch. I used an 80% whole wheat-rye dough to apply the tiger topping but any bread dough will do. Mix everything to a paste, adding the boiling water while stirring vigourously (you don't want clumps like I had) and let cool to luke warm. Right before you're ready to apply, mix in the oil. Spread your shaped but not risen bread with the paste, using your fingers or a brush. It will look and feel like wall paper glue, thick and white opaque. Cover your shaped loaves and let rest for their second rise and bake off as usual. Depending on how thick you layer it on your bread will get stark or less defined crunchy spots. "You can't change the way the wind blows, but you can set your sails accordingly!" ** Disclaimer: I know tigers are striped not spotted, technically this is a leopard bread. I know that. I'd like to enter this bread for a Yeast spotting (get it? spot, spot! hee hee), over at Susan's Wild Yeast. You are brilliant! This is really fun! Striped or spot, you have spotted the stripes! Wow, authentic Dutch Crunch! :) That is in fact how we always see it called around here. Yours looks much better than those. What a spectacular finish to a loaf. 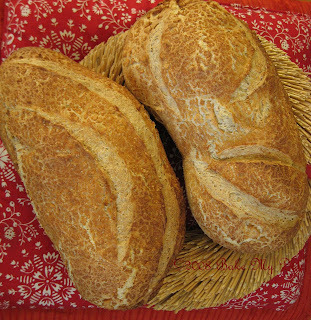 What a beautiful and unusual bread! Fantastic! Schitterend verhaal over "Tiger" en wat een goed idee om eens een tijgerbrood te maken. :-) Bedankt! Tanna's right, you are funny! Maarre.... wat is de functie van de gist dan nog? Want als je hem kokend heet water over zijn knar giet, istie dood. Toch? I'm trying this today. I think I'll try to shoot it, but I don't think it will be as pretty as your picture! Excuse me for commenting so late on this. And I'm really starting to come around to liking the idea of making a Dutch crunch covering for our next loaf of sandwich bread. wonderful! thank you for the recipe; I'lle try it this week-end.